Cedar Falls Tree Farm is located just East of North Bend, WA in the scenic Snoqualmie Valley. Our farm offers a natural and beautiful u-cut Christmas tree experience in a forest woodland containing fish ponds, streams, many walking paths and trails, and even a micro-hydro demonstration power plant where we produce our own electricity for the tree farm. We have a variety of trees, from fully sheared trees to more natural trees with good branch spacing. We work hard to give you the healthiest and most beautiful Christmas tree possible, and the most natural and beautiful tree hunting experience. At our farm we provide saws, helpers, hot cider, and candy canes for everyone. You can have your tree wrapped in red and white netting for a nominal cost to simplify your drive home and to make it easier to get your tree into your home. We grow many different varieties of Christmas trees, including Noble Fir, Turkish Fir, Fraser Fir, Grand Fir, Norway Spruce, Douglas Fir , Nordmann Fir, and Alpine Fir. We have a warm outdoor fire with a nice view of the valley to help you stay warm. 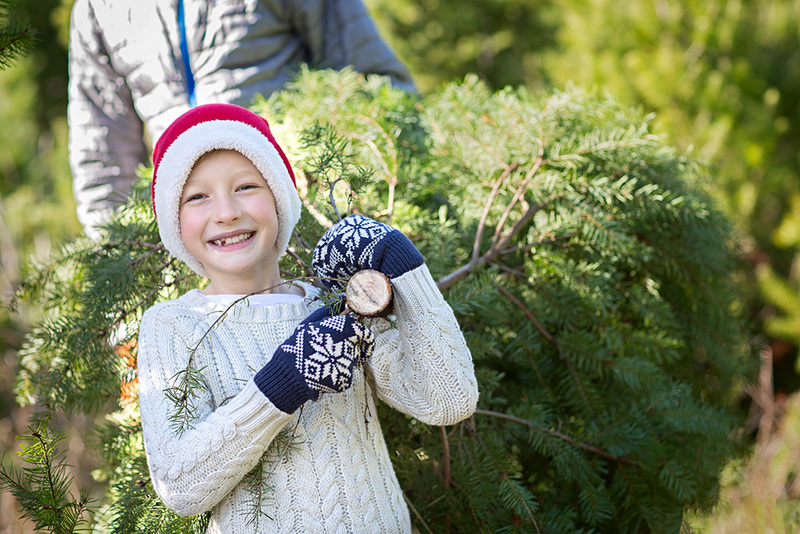 Bring your gloves, warm jackets and hiking boots in order to see all of the trees available on our large forest tree farm. We offer trees in all price ranges, and each tree is pre-marked with price, height, and species. We accept debit and credit cards, as well as cash and personal checks. Notice: We are closed effective Sunday, 12-02-18. Sadly, we have sold our supply of trees for the year. Happily, we are looking forward to seeing all of you next year, and we anticipate being able to be open longer next year. Happy Holidays! If we missed you this year, we will be here next year with a good supply of beautiful trees! We are located at 15200 Cedar Falls Road S.E., North Bend, WA. 98045. Please see the Contact Us page for a map to our farm. You may also call us at 425-785-3571. Directions: Take Exit 32 off of Eastbound I-90. Turn right at the exit and go slightly more than 1/2 mile and look for our beautiful wood sign on the left. We will be open again on the day after Thanksgiving 2018.